Located in the beautiful Jardin des Plantes, this comprehensive museum is both educational and entertaining. 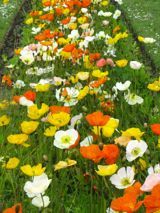 Above, Poppies in the Jardin des Plantes. The Muséum National d'Histoire Naturelle offers a wide range of exhibits covering all aspects of natural history. Its location in the Jardin des Plantes adds to the charm of the visit. In addition to seeing the natural history exhibits, you can also stroll in the lovely botanical garden, ride a carousel, or visit the small menagerie on the grounds. The Grande Galérie de l'Évolution tells the story of evolution, portrayed in its huge halls with displays of thousands of animals and skeletons. The Grande Galérie is an architectural masterpiece. Opened in 1889 (like the Eiffel Tower), it underwent extensive renovations in the 1990s to make it even more impressive. Galeries devoted to paleontology and comparative anatomy present exhibits ranging from dinosaurs to human skeletons, demonstrating evolution over time. The museum's collections are broad, and are supplemented by special exhibitions devoted to specific topics. The collections range from fungi and algae to spiders, crustaceons, and scorpions, from birds and mammals to meteorites, rocks, and minerals. The roots of the museum date to the early 18th century. French naturalist Georges Louis Marie Leclerc, commonly referred to as Buffon, became the keeper of the King's Garden and the Natural History Cabinet in Paris. Publishing extensively on natural history, he developed the museum over his years of service to the king. The buildings are historic and merit a visit in themselves, and there are even exhibits of art and furniture. A most unusual collection are the historic watercolors of the Vélins du Muséum, or Parchments of the Museum, painted on the skins of stillborn calves. You can also see Marie Antoinette's clock, rescued from Versailles, and the Cabinet des Curiosités, historic carved wooden cabinets formerly used to display dried animals. The Muséum d'Histoire Naturelle says that it is "The Museum for Everyone," and it certainly has a lot to offer! The museum and the surrounding neighborhood figure prominently in the best selling novel All the Light We Cannot See (Anthony Doerr, 2014). 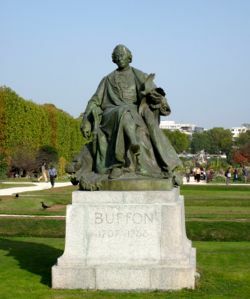 Below, Statue of Buffon, developer of the Natural History Museum.